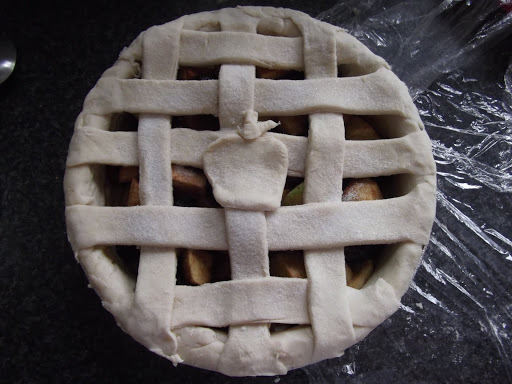 My Apple and Blackberry Pie was originally inspired by August’s Cultivate, Cook and Click Competition over at WeGrowOurOwn.co.uk. Unfortunately due to job interviews and assessment days, I completely lost track of time and forgot to submit it! But, this is a really quick and easy recipe that I have discovered is PERFECT for freezing! That means that you can forage for blackberries, and collect apples from your tree as they fall and prepare a delicious Winter Warmer despite the fact its still August! A top tip for any students out there is to batch cook and this is a brilliant example! If you have any fruit or vegetables that you don’t think you’ll be able to eat before they start to go off, then do some batch cooking, split the dish into individual portion sizes and freeze so that the next time you can’t be bothered to cook you have a home-made ready meal in the freezer! My parents currently have hundreds of apples falling off of our apple tree every day, we just can’t pick them quick enough, so my family have requested that I bake a couple of pies to pop in the freezer to eat when the winter nights draw in! Served best hot with a big dollop of ice cream, this Apple and Blackberry Pie really is a winter warmer! Roll out 2/3 of your pastry until it is large enough to fill a deep pie dish. Peel and core the apples and cut into 1.5 inch cubes. Place the apple into a large bowl along with the blackberries, spices and sugar. Mix together. 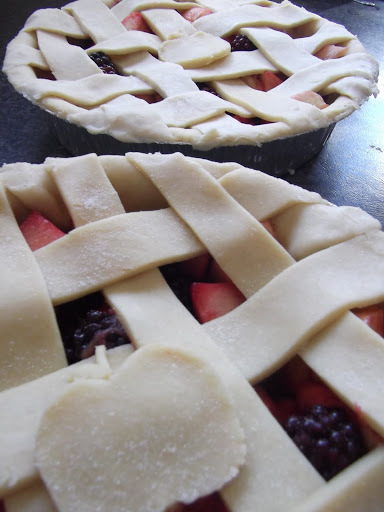 Roll out the remaining pastry and cut into strips long enough to cover the top of the pie in a lattice pattern (see pictures). Brush with an egg wash and a sprinkling of sugar. Bake in the centre of your oven for 45mins. 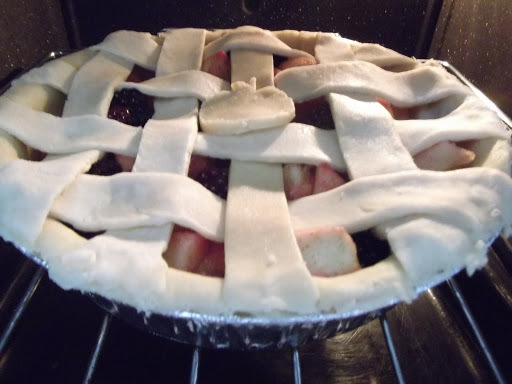 This pie can be frozen before cooking. If cooking from frozen, bake at gas mark 4 for 45 minutes before turning the heat up to gas mark 5 and cooking for a further 20 minutes. Knowing such a delicious pie is in the freezer waiting will make you forget the fact that as a student, you can’t afford the heating! What a cute pie! Well done!